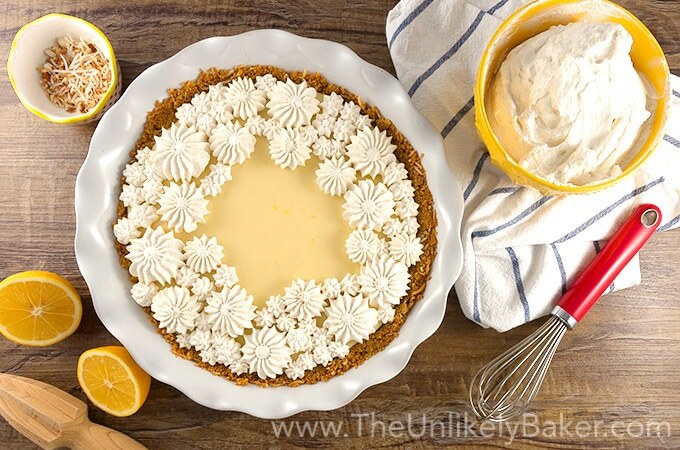 Easy Meyer lemon pie with condensed milk – perfectly sweet and tangy, luxuriously smooth and silky. 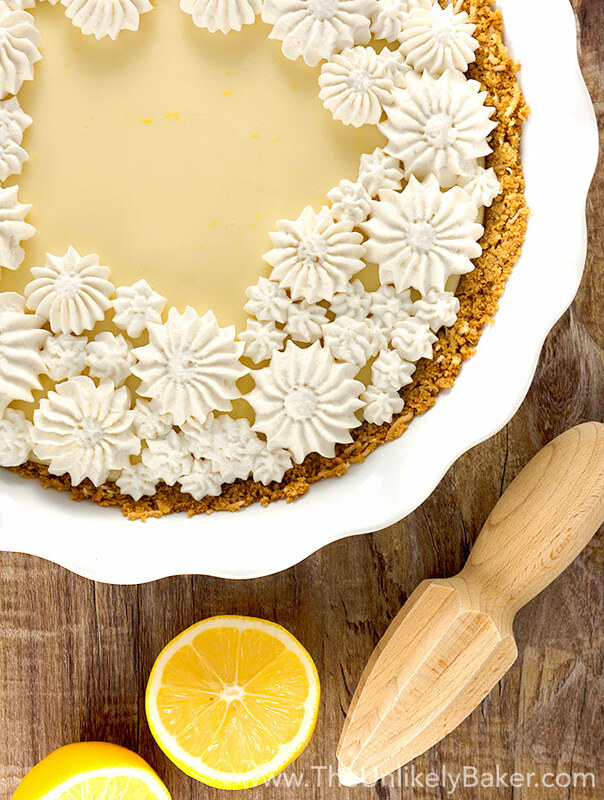 Every bite of this creamy Meyer lemon pie is a burst of bright and vibrant citrus flavour. Rich and so refreshing, it’s awesome with tea or as an end to a lovely meal. With words like “polar vortex”, “bitter cold” and “extreme cold weather alerts” in fashion once more, I am arming myself with the best cure for winter blues that I know – lemons, of course! Lemons (and other citrus fruits) are at their best in the winter and are really one of the few things I like about the season. They’re sunshine on a plate! Like this easy Meyer lemon pie. are a cross between regular lemons and mandarin oranges. They are juicy, less acidic and sweeter. Unlike normal lemons, which are available all year, Meyer lemons only appear in shelves between November and March. Sometimes the window is even smaller than that. So as soon as I see them, I grab a bag (ok, two) and go on a Meyer lemon frenzy. And Meyer lemons shine in this recipe for Meyer lemon pie. It’s so easy to make too! Just stir sweetened condensed milk, sour cream, Meyer lemon juice and Meyer lemon zest until combined. If you want the smoothest, creamiest pie filling, you have the option to sift your mixture through a fine mesh sieve into your pie dish. Bake for 20 minutes, chill in the fridge until it’s set and you’re done! Egg-free and done in a flash (this is similar to my recipe for perfect – and also eggless – key lime pie). It’s really the easiest lemon pie ever. These kinds of pie recipes usually have a graham cracker crust because they’re so great together. However, since it worked so well in my best lemon cheesecake recipe (have you tried it? So good! ), I did a similar crust for this pie – graham crackers and coconut. That flavour profile just works so well with the lemony filling. Think of it as your favourite graham cracker crust, but better! You simply add sweetened shredded coconut and omit the sugar. 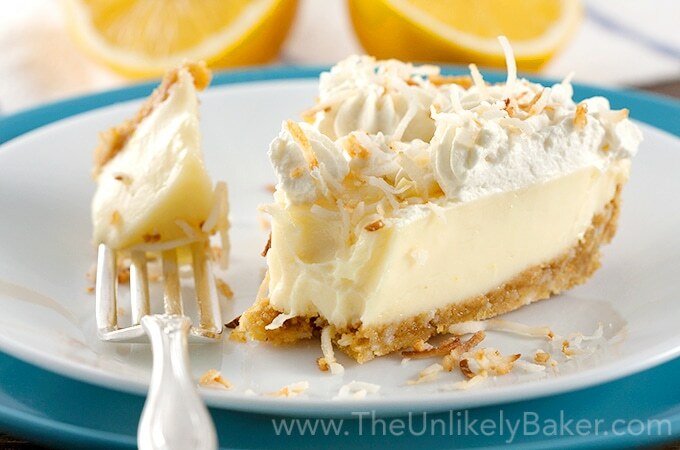 The combination of the Meyer lemon pie filling and the coconut cookie crust is just crazy delicious. It’s become my favourite crust to make and I’ve used it several times on TUB, like in these mouth-watering lime bars. All these ingredients together is the perfect balance between sweet and tangy. And did I mention it was so creamy? It melts in your mouth. Just wonderful! I love topping the pie with lemon whipped cream (to-die for) and more toasted shredded coconut. So how about it? Let’s get through these last few weeks (or months) of winter together with this creamy Meyer lemon pie with condensed milk. It really is a burst of sunshine on a gloomy winter day! If you love lemon as much as I do, you’d love these lemon desserts. Perfectly sweet and tangy, just how we lemon lovers like it! 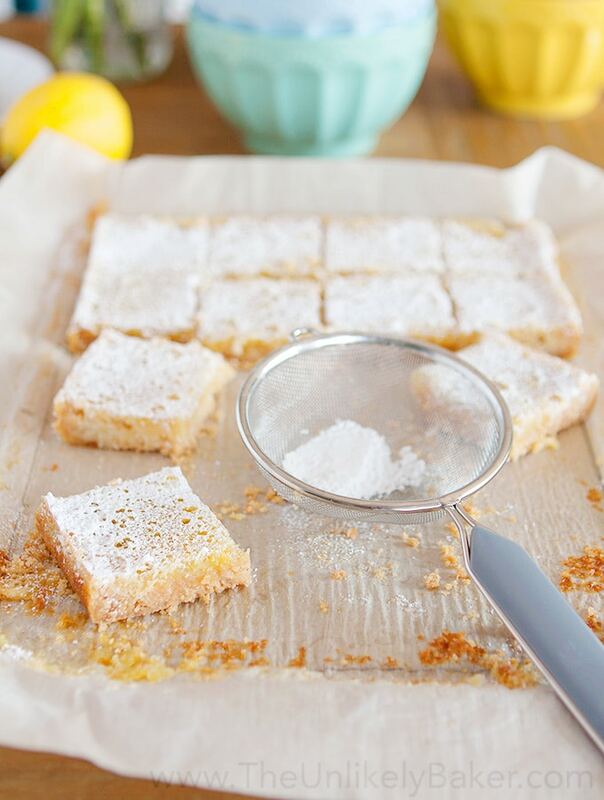 Every lemon fan should have a recipe for everybody’s favourite lemon dessert – lemon bars set on a delicious shortbread crust. 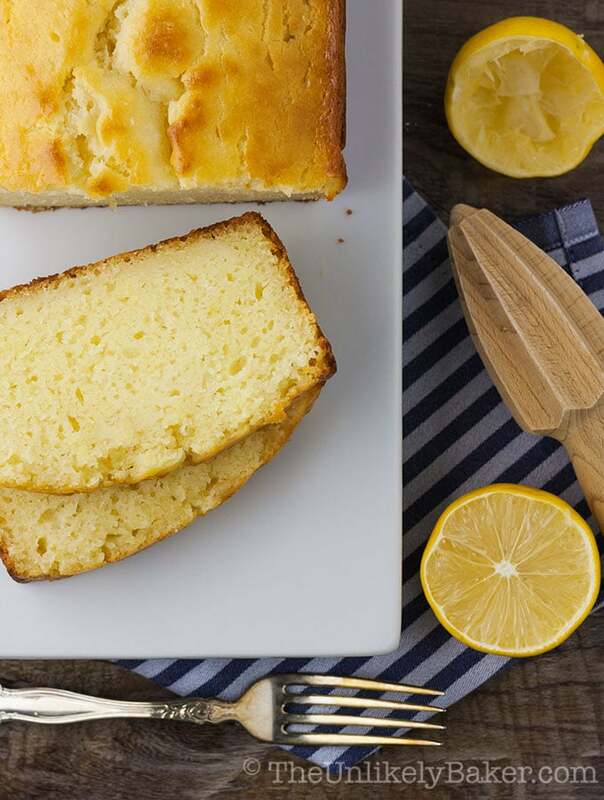 This sweet and salty, soft and moist lemon ricotta pound cake is sure to win hearts too. And lemme share a secret: I love lemons so much I have a whole category dedicated to just lemon recipes. Enjoy! Meyer lemon pie with condensed milk - perfectly sweet and tangy, luxuriously smooth and silky. With step-by-step video. In a small bowl, combine 1 1/2 cups graham cracker crumbs, 1/2 cup sweetened shredded coconut, 6 tablespoons melted butter and 1/8 teaspoon salt. Stir until evenly moist. Press onto the bottom and up the sides of a 9-inch pie dish. Set aside. In a large bowl, stir 2 cans sweetened condensed milk, 1/2 cup sour cream, 3/4 cup lemon juice and lemon zest until thoroughly combined. Optional: To ensure the smoothest filling, sift your filling into your pie dish through a fine mesh sieve to get rid of lumps (see notes). Bake for about 20 minutes or until the sides are starting to firm up but the middle is still a little jiggly (not soupy). Allow to cool slightly before chilling in the fridge so it can set completely, preferably overnight. Serve with lemon whipped cream and toasted shredded coconut. If you watch the video, you'll notice I did not put salt in the mixture. I actually forgot while filming but I added it in later. You can substitute regular lemons. Your pie will just be slightly tarter. If you opt to strain the mixture, note that you'll likely strain away most of the lemon zest. To achieve a more lemony flavour, skip the straining so that your pie filling has all the zest in it. Don't worry, it will still be super creamy! To make lemon whipped cream, just add lemon zest to this recipe for homemade whipped cream. Did you make this easy Meyer lemon pie with condensed milk? I’d love to hear from you in the comments section below. If you like pies but not as big a fan of lemon as I am (but why? ), you’ll find other pie recipes here. BTW just a friendly reminder: Valentine’s Day is around the corner! Planning to surprise someone with a really special breakfast? 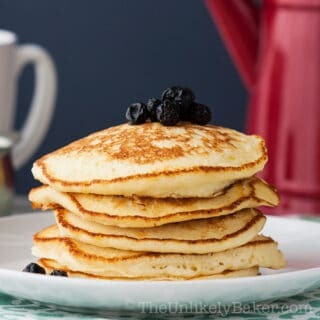 Check out this ultimate list of breakfast ideas. You’re sure to find a recipe here your loved one would love! Oh, My! This brings back so many memories. We use to do something similar with lemonade or limeade. Those pies were so good. My MIL was the one who introduced me to this method. I’d completely forgotten about it and how good it was. I’m going to have to make this. Thank you for the reminder. I love lemon pie! And I love the addition of coconut to your recipe as well. Looks and sounds delicious! Thanks Lois! They work together so well. I love Meyer lemons! They have such a subtle but unique taste. I’ll have to give this a try sometime because my hubby would LOVE it! You make it look so easy! My grandson has asked for a LEMON PIE for his birthday!! He is going to be 7!! This looks like it just might be the one. Sounds delicious…looks amazing. I LOVE Meyer lemons and wish they were available all year. Jolina, please clarify an issue for me. On the ingredients on your Creamy Meyer Lemon pie, you show two 10oz cans of the sweetened evaporated milk. I don’t find any 10 oz cans, only 14 oz. which is what you show in your supplies. On the instructions, you say to use 2 cans of the sweetened evaporated milk. Are you measuring out 20 oz or are you using two full cans that would equal 28 oz? Hi Ronda, I use 2 300-ml cans, which are the sizes available here. That converts to roughly 10-oz per can. If you can only get 10-oz cans there, I suggest to weigh 20 oz/600 ml for this recipe. Using 2 full 14-oz cans is going to be too sweet and your pie may not set properly. Hope this helps! Omg this lemon pie is what my dreams are made of! I too looooooooove lemon! 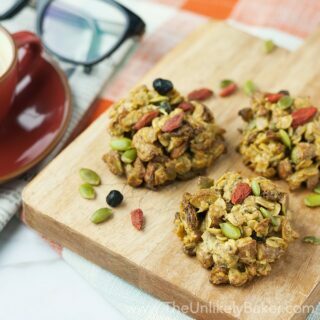 This recipe is so easy to make and is absolutely delicious! I just made it to take to my in-laws for Easter and there was a little extra filling leftover so I put it in a ramekin so I could try it. OMG amazing!! I used a cheater graham cracker crust and up’d the lemon juice to about 1c. YUM!!! Thanks for the recipe!! Hey, Jolina! Just wanted to say we made this recipe again this weekend. Hehehe, it’s so good! In fact, we made it Sunday and it was gone by Monday evening. I hope you have a great day, Jolina! Aw that made my day! 🙂 You guys are the best. Food that disappears is a great sign isn’t it?? Have a wonderful day too! I love how much you love Meyer lemons! I’ve only used once so far but they are much better flavor than regular. I haven’t seem them in my grocery stores much, I wonder why? There’s so many recipes to choose from if I do find some! How many Meyer lemons will I need for this recipe, please? It looks delicious! Thanks Jennifer. It really depends on the lemons you get. And it’s really not the size too eh? Big doesn’t always mean juicy because it might sometimes be just pulp. I’d say 4 and you should be OK. Having extra is a happy problem 🙂 Hope you like it! Would love to hear how it goes. Wow this looks absolutely amazing! I have been obsessed with all things lemon lately. 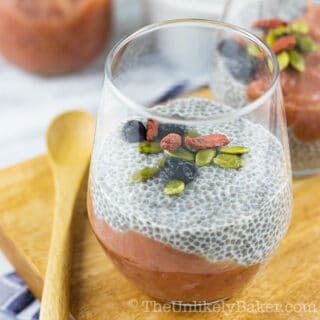 I can’t wait to wow all my friends and family with this amazing recipe! It makes me crave warm summer days! Lovely presentation. I have been on a lemon craze lately too! And yes, this pie gives me hope that winter will end too. Someday! Hope you like it Destiny. Lemon, especially Meyer lemon, is one of my favorite flavors for a dessert! This looks absolutely wonderful!! This pie is beautiful! Sound wonderful. Impressive blog and will be happy to try it some Filipino dishes. Lemon is one of my favorite flavors! It makes me think of summer and in the middle of February, I’m desperate for those days! 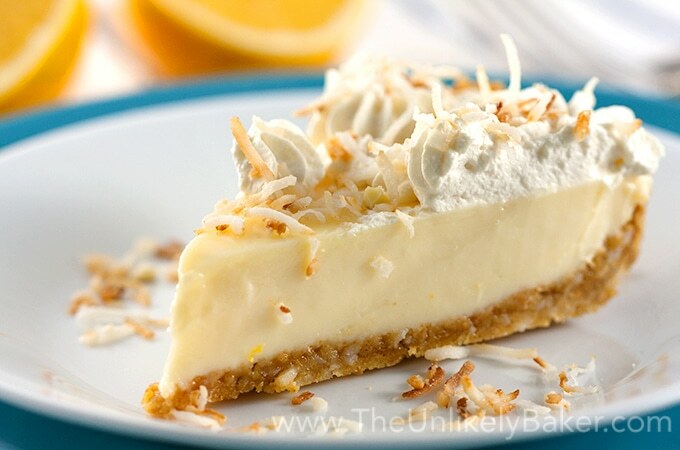 I think the coconut crust is a brilliant flavor combination too! Me too and yes, it makes me think winter will end…someday! LOL! The coconut crust works beautifully here, if I say so myself 🙂 Hope you get to try the pie soon Jessica! I love anything with lemons and this looks like the perfect dessert to me. Thanks for the recipe! My goodness I am in love with that lemon pie right away, it looks absolutely delicious & mouth watering. The pictures are so inviting that I would love to give it a try right away! Thanks a lot Lisa! Hope you like it! Made it yesterday night, it came out quite tasty. Definitely in the “make again” category. Thank you so much jolina for sharing this. So happy to hear that Supriya 🙂 And you are most welcome! This looks so good! I love pie and have yet optomkake a key lime one so I look forward to trying it out. This pie sounds fantastic! I love anything lemon, and this sounds like a great dessert to share! This looks delicious, lemon pie is my favorite. I have a lemon tree in my backyard and it grows so many lemons!! I have got to try this out soon! I’m so jealous! You have so many lovely lemon goodies ahead of you. Have fun! Lemon-flavored desserts are some of my absolute favorites so I’m 100% going to have to try this out. I just picked up a bag of meyer lemons at the store and wasn’t sure what to make with them. Thanks for the inspiration – this looks amazing, especially the coconut crust! I haven’t done much with Meyer Lemons this season! I really need to get my act together before they’re gone next month! This looks absolutely amazing, it sure would cheer up my winter blues! It definitely cheers mine up 🙂 And I usually freeze the juice and zest of Meyer lemons so I have my supply when they’re gone. This looks so delicious, and pretty too. I love a good pie! Super great for a cheat day!!!! Pure perfection! I would love to try this pie! Lemon is one of the best flavors. It’s so citrusy and fresh. I don’t think we have Meyer lemons where I live,, though. At least I don’t recall seeing any. They sound lovely, so I’ll be on the lookout. So, I finally found Meyer lemons and made this pie over the weekend. I substituted a gluten-free pie crust for the graham cracker crust, and the entire pie was gone in less than 2 days! It was amazing and so creamy and smooth. Great recipe! Will definitely be making it again. The lemon looks awesome and just the way I like, delicate and sophisticated. My son loves lemon flavored everything. He will be very happy to see this recipe. This pie is too gorgeous to eat and I will find it hard to eat such a beauty! However, I am sure my sugar cravings will get the better of me for sure! Love it!!! Hahaha ahhh but we must 🙂 Thanks! Hope you like it. This looks delicious! I make a cheesecake with Meyer lemons when I can find them, sometimes they’re hard to find around me. this looks like a piece of art! Im a huge lemon person so this is so my kinda food! Thanks Neely! Then you are definitely my kind of person 🙂 Yay to lemons! Wow! all of these desserts look delicious. I’m not a big fan of lemon flavor but id make this for a get together. I am not a pie person. 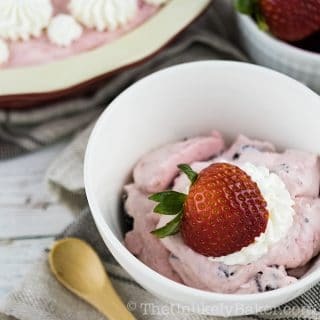 However, this dessert looks amazing and easy to do at home. That is the most beautiful pie!! I am extremely envious of your piping skills! And your recipe sounds so delicious. I first came across Meyer lemons when we lived in the US for a few years. Since, returning to Switzerland, they are nowhere to be found here, although I was lucky to find a Meyer lemon tree last year and I have been doing my best to keep it alive. There are three small fruits which are starting to ripen, and I’m already thinking of how to put them to good use, especially since it will be another year before I will have anymore (fingers crossed). Thanks for the delicious recipe! This sounds awesome and is beautiful to boot! I love Meyer lemons. Wow! I am not big on desserts. But, I would have a hard time passing this up! OMG this looks DIVINE! Your photos are amazing, I wish I could just bite right into them! We will not be getting an early spring so I must make this wonderful and delicious pie because lemon makes me happy! Looks so beautiful and decadent!! Yes, let’s have lemons to counter the gloomy winter weather! 🙂 Thanks Kathy! You had me at “Coconut Cookie Crust!” I am crazy for coconut. Absolutely obsessed. In fact, I could probably eat the crust alone! Oh my your decorating on this is so pretty! I love the idea of the coconut crust, so delicious. Mine would NEVER turn out like this I am certain but I’d like to try it. I love a lemon dessert! Thanks a lot Amy! I’m sure you’ll do great 🙂 Hope you like the pie! This looks delicious! 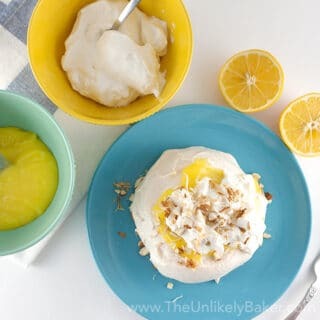 I love lemon desserts, so I’m adding this to my to-make list! 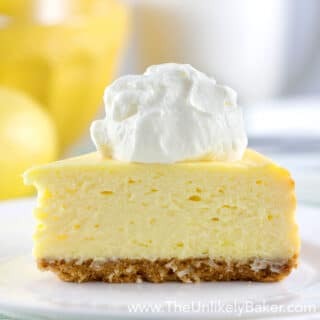 Growing up Lemon Icebox Pie was my favorite and it was so quick to make! This reminds me of that, just fancier! Will be trying this in the near future!! Would you believe I’ve never had lemon icebox pie? Haha. I should definitely make some. Thanks Dene! I hope you’ve saved me slice! 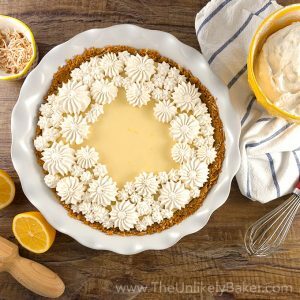 I don’t know what I’m drooling over more- the coconut graham cracker crust or the Meyer lemon filling! It all looks so amazing!! I spotted this on pinterest and instantly loved it. This sounds AMAZING! Coconut and lemon, right up my alley. This look beautiful and delicious! a deadly combination.I love the whipped cream flowers an original touch. Another delicious treat! I can clearly see your love for Meyer lemon…I’m going to start trying Meyer lemons. This looks delicious!!! Definitely going to try! My husband loves lemon meringue pie. He’s always happy to try new lemon based recipes so I’ll be trying this out soon! Love lemon and I love coconut. Would you believe that I’m in Florida and I find Meyer lemons hard to find? I know it sounds crazy but I think they send all of them to Canada and there’s a person up there that grabs all of the bags. You wouldn’t happen to know her, would you? 🙂 Seriously, though, I am telling the truth about finding the lemons down here. This recipe sounds fantastic. I’m pinning! HAHAHAHA this almost made me fall off my chair laughing Marisa. And no, I have NO IDEA what you are talking about lol. Hope you do get your hands on some Meyer lemons. If not, regular lemons work too 🙂 Thanks for the pin! This pie looks stunning! I’ve never tried meyer lemons but I think I need to. I always love recipes that incorporate a little tangy flavor! Me too! It’s so refreshing to the palate after a meal. Hope you like this pie Stephanie! Oh my, this pie is so pretty! Perfect for the coming spring. I’m pinning for later! Thanks Vanessa! It does give me hope that spring is bound to come sooner or later 🙂 Appreciate the pin! I agree with you! Coconut and lemon are such a great pairing and lemons have an uplifting effect! This is definitely a dreamy pie, beautiful and oh so delicious! Thanks Nicoletta! I do love that combo 🙂 Happy Monday! Is there anything better then meyer lemons? Only when they’re in a delicious pie like this! I’m in luscious lemon Heaven. I love lemon desserts and this is a beauty. This pie would brighten up even the gloomiest of Winter days! Hi Megan! I love lemon desserts too. I might get hate mail for saying this but I like it better than chocolate lol!! Meyer lemons are just lovely. Hope winter is not too gloomy where you are. This sounds AMAZING.. I just found myer lemons at the store and need something to use them in! HAHAHA all these famous groundhogs need to meet THEN make the announcement eh?? And how awesome are their names? Too funny. I go a little nuts when I see Meyer lemons TBH. I know I still have some at home but I can’t resist buying more lol. I need a Meyer lemon intervention. Yum! Lemon Pie’s are my all time favorite dessert. My grandmother could make the best pie. Your recipe sounds amazing and it is on my to make list. Anything grandmas make are the best in my book 🙂 Hope you like this version Tina Marie! I got a bag of Meyer lemon last week too and made a babka. Love the flavor and citrus is my favorite dessert flavor! Love the creamy filling, the photo itself makes my mouth cold and lemony! You’re becoming a really good baker Suchi! I’d love some of that lemony babka 🙂 And yes, Meyer lemons are pretty awesome aren’t they? BTW how’s everything? Are you guys finally done with the move? Hope everything’s going great! Thanks Jolina! No not yet, we are waiting for Jay”s job but most tentative is April 1. I will be going little earlier for apartment and stuff. Hi Dawn! I know me too, we’re under an extreme weather alert again today haha. Oh well. We have lemons! Aren’t they just wonderful?? 🙂 We’re so biased lol. Thanks for the pin!